A dog lover spoke of his amazement today after he was reunited with the runaway pet pooch he thought had died — two days after burying the wrong animal. Scott Walker, 36, had been searching for his missing Border Terrier Jimmy for a week when he received devastating news that a dog had been found flattened on a busy road. A heartbroken Scott and his girlfriend Cathy Herse, 35, went to the scene and as the dead dog was barely recognisable the couple thought it was their beloved Jimmy. The tearful couple then said their farewells and buried the dog but two days later Scott received a phone call from a lady who had found Jimmy. Scott, from Edinburgh, said: “It’s unbelievable, but true. It really is a Christmas miracle. “We got a call from a lovely lady saying she found him in her garden. “She managed to get him to come for food and she popped a lead on him. She then got him some food and water and called us. “We drove up thinking it was probably another Jimmy, but it was him. “We got a very warm welcome from him and he’s now sleeping in his favourite place. The incredible story began when digital designer Scott and his girlfriend Cathy spent a week searching high and low for Jimmy after he ran off chasing a deer during a lunchtime walk in Pentland Hills, near Edinburgh, on December 10. The couple printed off more than 1,000 flyers and 100 posters to draw attention to their plight and Scott even took a week off work to concentrate on the search. 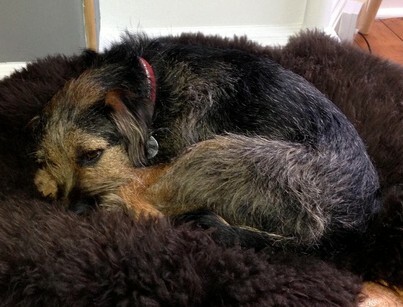 Five days later, they received the news they were dreading, a black and tan border terrier had been spotted lying dead on the City of Edinburgh Bypass, within three miles of where Jimmy was last seen. Unrecognisable from the bright-eyed dog they once knew, the couple retrieved the body before laying it to rest near a walking route beside Swanston Golf Club. However, two days later their grieving was interrupted by a phone call from a resident in nearby Fairmilehead, who had spotted a “missing” poster they had placed on Facebook. She said she had Jimmy and that he was fit and well. Scott said: “I couldn’t believe it. To say we had given up hope was an understatement. We had just buried him after all. We drove over thinking it was probably another Jimmy, but it was him. “We got a very warm welcome from him. He was limping slightly and had a wee bit of a wild look in his eye, but other than that he was fine.